According to the Learn to Ski and Snowboard Month, 94 percent of skiers and riders came to the sport through someone else. In my case, I can’t thank a childhood friend. That honor goes to someone I met much later in life, my father-in-law, Jack. Through his support and encouragement, I have gained friends, physical conditioning, and a means to thrive not only in winter, but year-round. Though Jack was a native of Wisconsin, he moved to southwest Michigan, not exactly a hotbed of skiing, after spending some time in the Navy and then finishing his college degree. Along with his wife, Jan, he met some neighbors, and the two of them launched a lifelong involvement in skiing. The man who took me into the world of snowy goodness. Jack and Jan knew old-school skiing. A pair of his old skis stands in my office. They’re freakishly long by today’s standards, and about 50 percent longer than the skis I learned on. With no plastic topsheet or base, their color resembles that of a piece of lumber. So does their shape. The one binding — the other was lost, long ago — consists of a flat plate with a spring. How he was able to make turns on those things, I don’t know, but they make me appreciate the technology we have today. Old-school skiing also meant using an old auto engine to power a tow rope up a local hill. As family members recall, there was a small warming house, and that was about it. Jack and Jan had three children, and they taught each of them to ski, starting out with a small mound in the front yard. My brother-in-law reflects in wonder: “He never complained and he never got frustrated teaching his three little kids how to ski. How was that possible?” In time, the family made four- and five-hour trips to resorts in northern Michigan. Shortly after my wife and I married, Jack and Jan took us to a local nature preserve for an outing on Nordic skis. I didn’t do too well with it, but my reward was a hand-me-down pair of skis, which I kept for a long time. Five years later, the two of us moved to Ohio for graduate school. During my first semester there, Jack invited us to join him, Jan, and a group of friends on a trip to Aspen. Wanting to burrow into studies, I stayed home, while my wife joined her parents. Pity the fool I was; I had no idea what I was missing. That was the last I heard of skiing for a while. Eight years later, we were living in Chicago, and the invitation came again. Though Jan had stopped skiing, I decided that it was time to join the rest of the family in its longtime pursuit. But first, I had to endure a further separation, of three days worth of ski lessons. The experience was challenging and exhausting. But I was hooked. We returned to the mountains the following year, and the year after that, and a few more years after that. We shared chair rides, descents, hotel rooms, meals, and the companionship of about two dozen people who joined us every year, people who had known Jack from his days in the workforce. We had some great times in great places. From the start, Jack was my enabler in skiing. On our first trip, he found a coupon that let me buy three days of lift tickets, lessons, and rentals for $1. That one dollar has had a greater effect on my life than another other dollar purchase. Each year, he generously paid for a large part of my expenses, making the trips accessible. 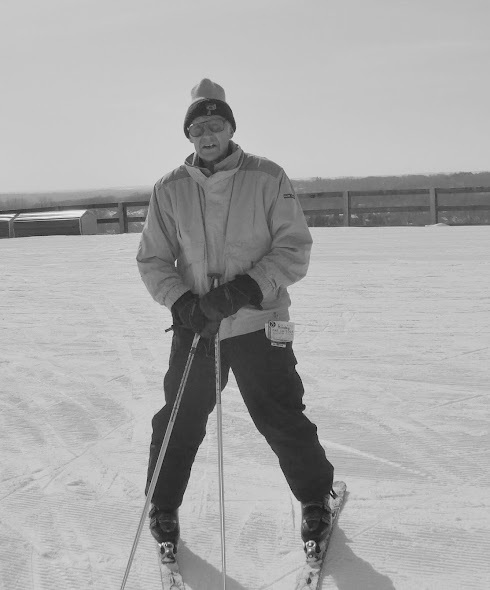 Already in his 70s by the time I joined him, Jack was a competent and enthusiastic skier. A father even on the slopes, he would often “sweep,” skiing as the last person in our ski party, making sure that everyone got to the bottom safely. He was there when I fell five times in one day, and couldn’t figure out how to get my ski boot back into the binding. He let me fiddle with it for a few minutes, and then showed me how to fix the problem. Another time, he came to my rescue by walking a ways up the hill to help me (again) get into my bindings. He watched my progress on skis, and I eagerly awaited for the time I could take my first black diamond trail. When he suggested a black slope for our next descent, I was thrilled. I had arrived. And when I took up snowboarding, his support helped paved the way for the skeptical group of skiers to accept my new tool for alpine fun. Even though I didn’t take up skiing until I was 36, I was in some ways still young and foolish in early life on skis. In the second or third season, my enthusiasm and energy conflicted with Jack’s more mellow approach. He liked to stop at the edge of a trail and take it the scenery and experience, whereas I would like to blast down the hill. He also liked to spend most of his time at Buttermilk, the gentlest of the four mountains in Aspen. But sometimes he would join me on more challenging terrain, and over time I grew to appreciate a more casual pace as well. As he told me at the end of one trip: “This is your last day here. You should keep something in reserve. You should stop and smell the roses.” Or at least the pine trees. He wasn’t one to spend all his time in the lodge, though. His son remembers: “Dad never backed away from an opportunity to ski, whether because of weather, us little kids, or because he was tired.” And indeed, sometimes he would surprise me by taking “just one more run,” and sometime we were close to taking the last chair. Not bad for a man in his mid-to-late 70s. When he was 75, he bought a new pair of boots and skis. “What an optimist,” Jan chuckled as she told me the news. As will be the fate of everyone, physical troubles would eventually overtake him. One summer, he developed joint and muscle pain so badly that he decided to stay home the following winter. It felt like an era had ended, and none of us children made the trip. Happily, we received a reprieve when Jack stopped taking his cholesterol drugs. The pain disappeared, and he was ready for another trip. This one, though, would be unlike the others. On our first day back, I was alone with him on Buttermilk. The two of us paused to take in the valley, the white snow, the green trees, and the bluebird sky. “This is why I came back,” he told me. The patrol came, took him to their facility, and gave him oxygen. We went in for the day, and my wife called from the airport. She had arrived, and I was relieved. “Your dad needs some help. I need some help,” I told her. While it was now time for me to return the favors of many years, the task of watching over my now-frail father-in-law gave me a lot of anxiety. For the rest of our trip, Jack’s children and I took turns watching over him. Though fear stuck with me, one day he surprised me by heading down a black diamond with us, and we were done in what seemed like record time. At the end of that trip, I wrote in my ski journal, “I’m not sure we will return here. Jack is 79, and while ‘you never know’ applies at any age, it’s more true as someone approaches 80.” Return we did, for one last hurrah. Jack fell another time or two, and we dialed back our terrain even more. But we were back in a beautiful place, enjoying our skiing and riding. While Jack had skied during his 80th year–a goal he had set for himself–we all knew that this would be our last trip together. A few years later, we found out the source of his troubles, when he was diagnosed with form of dementia that affects balance as well as mental processing. His boots now have little wear on them. I’ve taken his skis out for a day at a local hill. They’re much heavier than my own skis, which again makes me wonder at Jack’s now-faded ability: How could he maneuver with such heavy skis? Now, he can’t walk by himself, let alone ski, and while his mind may still store fond memories on the snow, the words to describe them are hard to come by. The ski talk does not go beyond generalities, though when I show him some photos of some favorite spots, he seems to pay attention. It’s a sad end to a long ski career. My own days of sliding on the snow will also come to an end some day. How it will come, I don’t know, but it will. That’s the human condition. But if being human means facing decline, it also means that we have the chance to love people and offer to them those things that inspire, awe, and thrill us. For millions of Americans, that includes skiing and riding. They delight, strengthen, and stretch the body and soul. If you’re a skier or snowboarder, you owe a debt of gratitude to the person who brought you to that wonderful state.